If you need someone to help install new decking, repair existing installations or help preserve your decking in Ascot, Virginia Water, Bracknell, Maidenhead, Reading, Sunningdale, Wokingham or anywhere in between, we can help. In recent times, timber decking has become a very popular alternative to concrete paving. Stone Valley have carried out all sorts of decking work, ranging from a simple flat deck patio area to laying a three or four tiered deck (with lighting) that covers the whole garden area. 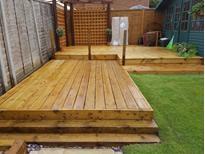 All decking built by Stone Valley is constructed on a decking frame secured to the ground by a concrete mix. In addition, all of the timber products are fully treated against any normal timber deficiencies. Due to its excellent flexibility, timber decks can be cut to any size or shape that you wish and it is a simple job to add further timber products to it if necessary. 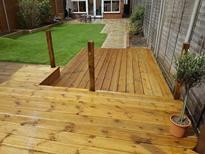 Balustrades can add safety to the decking (especially if there is a drop to another part of the garden). However, a length of thick roping links between the decking posts can provide an equally effective and more cost effective solution. Enhancing your decking with lighting and / or a water feature is also very popular. Built-in decking lighting is a very popular choice - we will be happy to provide you with a fully qualified electrician to carry out any electrical work at no extra cost! However, if your budget won’t stretch to decking lighting, we have found that Roman Candles placed around the decking area can be an cheaper alternative way of creating light when the sun starts to set. 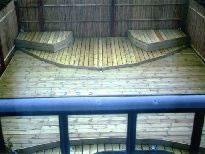 A water feature built within the deck is another popular choice. Lighting the water feature and the deck can provide outstanding results. 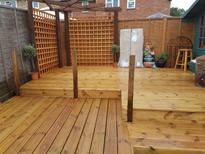 If you want to create some shade on a decking area then why not have a Pergola? They’re built using timber and therefore don’t need to cost the earth to be made effective. We operate across Ascot, Bracknell, Maidenhead, Reading, Sunningdale, Virginia Water, Wokingham and everywhere in between. Our decking photo gallery features just some of the many different decking solutions we have provided for our customers.